Coffee Press, Tea Kettle, Tea Infuser, Yerba Mate Bombilla, Gourds! • Chrome Coffee & Tea Press: Chrome Coffee Tea Press easily brews rich, flavorful coffee and tea. Extra filter in lid avoids no loose grounds get into cups. Ideal for making small amounts of coffee and tea. Hand wash. Capacity, 30 oz./6 - 5 oz. cups. Instructions included. measures 8 x 4 x 6½ inches. BUY NOW! • Coffee-Tea French Press 6 Cups: Brew the richest, most flavorful coffee you have ever tasted with the Coffee-Tea French Press. 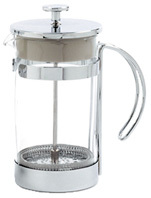 The "French Press" or infusion brewing process delivers the very best coffee and tea. Works better than traditional drip or perk methods. Hand wash. Capacity 30 oz./ 6-5 oz. cups. ORDER NOW! • Stove Top Expresso Maker: Brew your own espresso easily with this classic Italian design Stovetop Espresso Maker right in your kitchen. Features premium quality construction with a polished aluminum body. Suitable for use on gas, electric, glass and ceramic stoves (not induction). Great when on the go - camping, traveling, for business, vacationing or anytime you need to make espresso from a compact unit. Handwash only. 16 oz. BUY NOW! 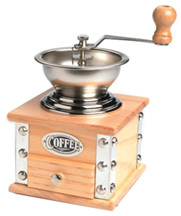 • Coffee Grinder: Classic old world pattern Coffee Grinder appears antique, but is truly a new replica. Fully-functional mill can grind your fresh beans and place the grounds in the small drawer. Easily adjustable to grind precisely from fine to coarse. Made with Pine Wood and Stainless Steel trim, handle and bowl. Wooden base and drawer. Great addition for any kitchen. Measures 4¾ inch X 7¾ inch. BUY NOW! HOME CARE: Chrome Coffee & Tea Press, 30 oz. HOME CARE: Stove Top Expresso Maker, 16 oz. 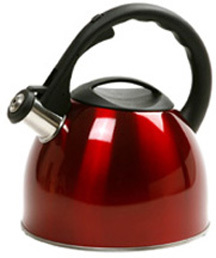 • Red Whistling Tea Kettle w/ Black Stay Cool Handle Stainless Steel: An elegant addition to your kitchen, tea kettle with its classic whistling alerts you when the water is boiling and its tea time. Made of stainless steel with an encapsulated base. Easy lock and release whistling spout with stay cool handle. Comes in an exquisite glossy red. Hand washing recommended. Measures 9 x 8½ x 7½ inches and holds 2.75 quarts or 2 ½ Liter. BUY NOW! • Keurig 2.0 Carafe: Keurig 2.0 Carafe is designed exquisitely for use with the Keurig® 2.0 brewers, provides the simple convenience of a brew-through lid and easy-pour handle. 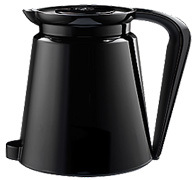 Keurig 2.0 Carafe is constructed of double-walled plastic to keep beverages warm for your enjoyment. Sensor mechanism keys to brewer and work together with user interface. Holds up to 4 cups of coffee (32 oz. capacity). ORDER TODAY! White Porcelain Tea Charm Tea Infuser: Tea Charm Porcelain Tea Infusers are 1½ inch and made from 18/8 Grade Stainless Steel, with a white porcelain ornament for the chain. While chains are there to hang over the side of the cup and not allow the infuser chain to fall inside into the tea, they are also collected by many tea drinkers. Add fancy to your tea time with our Tea Charms. 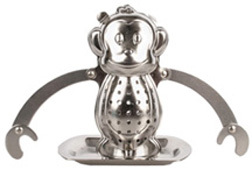 Made of white porcelain to hang off the chain of the included 1½ inch diameter stainless steel mesh tea ball. Dishwasher safe. All parts are made from stainless steel. ORDER TODAY! • Tea Infuser BUNNY Charm: White Porcelain & Stainless Steel. ORDER TODAY! • Tea Infuser OWL Charm: White Porcelain & Stainless Steel. ORDER TODAY! • Stainless Steel Tea Infuser Teabag Shaped:Teabag Shape Tea Infuser is an innovative addition to tea brewing. 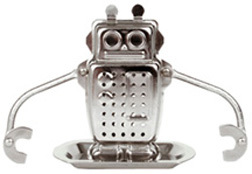 Tea Infuser is 2½ inch and made from 18/8 grade Stainless Steel. Ingenious design creates a permanent reusable "tea bag" with bottom opening that's easy to fill and clean with traditional chain with hook. Dishwasher safe. All parts are made from stainless steel. ORDER TODAY! • Stainless Steel Tea Infuser & Tray Teapot: Stainless Steel Teapot Tea Infuser w/ Tray is ideal for brewing tea. Pull the chain to pop off the lid, fill with loose tea leaves, pop the lid back on and drop the infuser into the teapot. After brewing, lift the Teapot Infuser by the chain and place it on the Tray leaving no drippy mess. It stands 1½ inch tall and is 1.75 inch in diameter. Hand Wash recommended. All parts are made from stainless steel. ORDER TODAY! 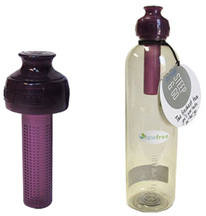 STEEP & GO Cold Brew Bottle Infuser has its own reusable eco-friendly bottle so you can cold brew tea on-the-go! In just 10 minutes you'll have fresh iced tea packed with antioxidants and great flavor. Free from sugar and preservatives, you can relax seeing precisely what you're drinking - simply fresh tea! Works great with most green, white and herbal teas. Best Cold Brew Teas. Cold brewed tea doesn't get bitter or oversteeped - just smooth, flavorsome, and refreshing! Dishwasher-safe (Top Rack). Travel-friendly. BPA-free. 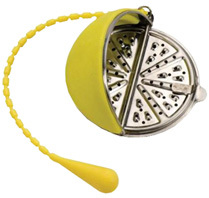 • Mesh Tea Infuser: 1¾" round mesh ball attached to a 4¼" scissors style handle. Completely made of stainless steel. Grip the scissor-style handle and squeeze. Mesh ball divides into two halves for convenient tea filling. Stainless Steel. ORDER TODAY! • Tea Infuser Spoon: Handle is 4½" long. Teaspoon is 1 7/8" long and perforated for tea diffusal. Handle is composed of spring-style grip attached to spoonbowls with an x-brace. Grip handle and squeeze to separate spoons. All parts are made from stainless steel. ORDER TODAY! • Tea Ball w/Caddy: 2" metal ball on a 3" chain with 1" hanging clip. Metal ball is perforated for tea diffusing. 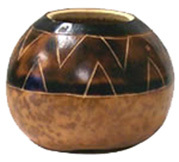 Tea caddy is bowl-shaped 1 7/8" in diameter and 1" deep. Twist and pull metal ball in the middle to pull apart. Tea ball sets in caddy for convenience. All parts are made from stainless steel. ORDER TODAY! • Mesh Tea Ball: Use for bulk teas. Unclip ball to fill with dry herb. All parts are made from stainless steel. 2" / 2½" / 3". ORDER TODAY! • Pyramid Tea Infuser 1¾ inch: Exclusive Pyramid Tea Infuser is made from stainless steel mesh in a distinctive pyramid shape. The flat base opens for easy filling, and stays in place when removed from the cup or mug. Stainless steel dishwasher safe. Measures 1¾" square base X 1½" tall X 4" long. BUY NOW! • Mesh Tea-Spice Ball 3 inch: Use this large sized mesh tea/spice balls to produce flavorful dishes. Fill with spices and herbs for soups, stews, drinks, broths, gravies, and more! 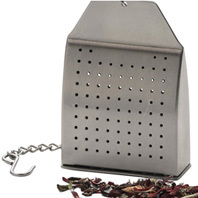 This stainless steel devise allows you to have loose leaf tea with the ease and convenience of tea bag teas. Make tea fresh and exciting. Made of 18/8 stainless steel. Measures 3" diameter. Create your own garni bouquets. Great gift idea. Dishwasher safe. BUY NOW! • Celestial Mesh Infuser 2 inch: This attractive tea infuser features sun, moon and star cut-outs along its rim. 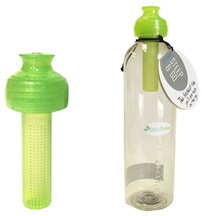 The infuser is specially designed for use with teapot or cup. The stainless steel tea mesh strainer measures from 2" (mesh) and the outer celestial rim is 3". Stainless Steel. BUY NOW! 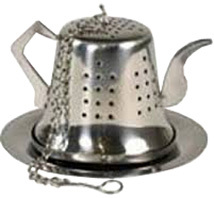 • Tea Strainer w/ Drip Pan 2": Use this Tea Strainer when relishing your loose leaf tea. Simply place the Tea Strainer is placed on the top of your cup. After pouring your brewed tea through the strainer to catch the loose leaves, and swing the strainer back in place over the drip bowl to catch any drips. Measures 2.7 x 2.7 x 4 inches. ORDER TODAY! • Mesh Ball w/ Heart Chain 3½ inch: Mesh Ball is constructed with stainless-steel to easily brew loose leaf tea also with spices and potpourri. Attached with a charming heart chain. Measures 3½-inch diameter. BUY NOW! Mesh Tea-Spice Ball 3"aaaaaCelestial Mesh Infuser 2"
Tea Strainer w/ Drip Pan 2"aaaMesh Ball w/ Heart Chain 3½"
Celestial Mesh Infuser 2 inch | Tea Strainer w/ Drip Pan 2"
• Floating Tea Infiser w/ Caddy: Floating Tea Infuser is designed to swirl and bob at the surface of a tea cup or pot. When desired strength is reached, remove the infuser by the knob and set into the caddy to catch drips. Made of dishwasher safe 18/8 stainless steelBUY NOW! • Mesh Ball w/ Celestial Teapot Weight: Mesh Ball is a 2 inch Stainless Steel infuser with Celestial Teapot weight. Simply fill infuser half full with loose tea. Immerse in boiled water and let steep for 3 to 6 minutes. BUY NOW! • Mesh Tea/Spice Infuser Heart Shaped: Easily brew the most flavorsome tea with this 2 inch heart shaped Tea Infuser. Includes a chain that can be clipped onto the outside of your mug. Fill your preferred tea and drop the infuser into the teapot, also ideal for spices and loose leaf tea. Remove when the tea has steeped to desired strength. Stainless steel construction. Measures 2"/5cm diameter. BUY NOW! • Tea Ball 1¼" w/ Teapot Handle: This handy stainless steel Tea Ball infuser featuries a 2½ inch handle with an attractive tea pot on top. Fits in all sizes of mugs and small tea pots. Simply fill a small amount of your favorite loose tea into the infuser and immerse into a cup of hot water for a delightful beverage. Measures 1½ x 1½ x 4 inches. BUY NOW! • Tea Tongs 5½ inch: Squeeze and remove tea bags from hot water. Stainless Steel. China. ORDER TODAY! • Lemon Press Bird-Shaped: Bird Shaped Lemon Press, Stainless Steel. ORDER TODAY! • Drip Coffee Maker w/ Pot, White Porcelain: Drip Coffee Maker includes a porcelain pot with lid and a porcelain #1 coffee filter cone. This beautifully white glazed ceramic Coffee Maker quickly makes two cups of coffee. Great for any kitchen and home. Simply place a coffee filter and grounds in the cup-shaped strainer, then pour hot water over the grounds. It's easy and microwave, freezer and dishwasher safe. Holds 2 ¼ Cups or 19 oz. ORDER NOW! TEA: Drip Coffee Maker w/ Pot, 19 oz. • Gaucho Gourd: The Gaucho gourd is a gourd of simple beauty which honors the free-spirited nature of the Gauchos (Argentine cowboys). The Gaucho gourd comes with a 10-page color booklet that provides directions on curing, packing, and caring for your gourd, as well as the rich history of the gourd in South American culture. Sharing a gourd is a ritual of hospitality and friendship. (Guayaki Yerba Mate). ORDER TODAY! • Bombilla Stainless Steel: Stainless steel Bombilla is the ideal friend to any of the gourds. Stainless steel is easy to clean, doesn't oxidize and is durable. (Mate Factor) ORDER TODAY! 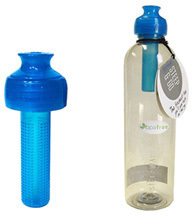 • Filter Straw: This bombilla (metal filter-straw) is hand-crafted from a stainless steel. It will not rust, flake, or peel. The end of the filter is designed for scraping out gourds. Used to filter the yerba mate from the gourd, the bombilla provides a direct herbal infusion. (Guayaki Yerba Mate) ORDER TODAY!